Oh to have that view (only warmer!) And that light... my my. Hey Marie! Love your point of view for the day...especially the Swedish version! linda, that bo-ho, mix-y is perfection to me, especially that dining room...thanks for thoses shots! That painting with the open dishwasher is fantastic! I want to do this in my attic. And if you ever want to part with your leather chair, you know who to call...Igloo Boy. What's that one commandment about envy? I forgot it completely when seeing these gorgeous pics! Awesome! Love the way they just went for it in all of these spaces. Not one of these looks like my home or anything I have ever done, yet I love them all. they speak to you because they really say something about the person that designed the space. I like that. A certain genuineness. Is that a word? Ah, you know what I mean! the crisp white w/ all the lively color really wakes up your senses! I love this decor....my mind doesn't think that way, I wish it did....I could be very comfly! Love that living area and study! Oh Marie ... you have inspired me. Hi Marie....looks devine in Sweden! Wow. Love the second photo!!! You know what caught my eye...that fantastic turquoise work bench...kind of table!! LOVE IT!!! I was to blog about this house but you beat me to it...Oh you did a very wonderful post and I'm so lovin' it. Linda you are amazing I love your images, you brighten my day always! The rooms are well lit and bright! Love them all! Yes, that is one cool house! I think every square inch of this house is wonderful...so fun!! 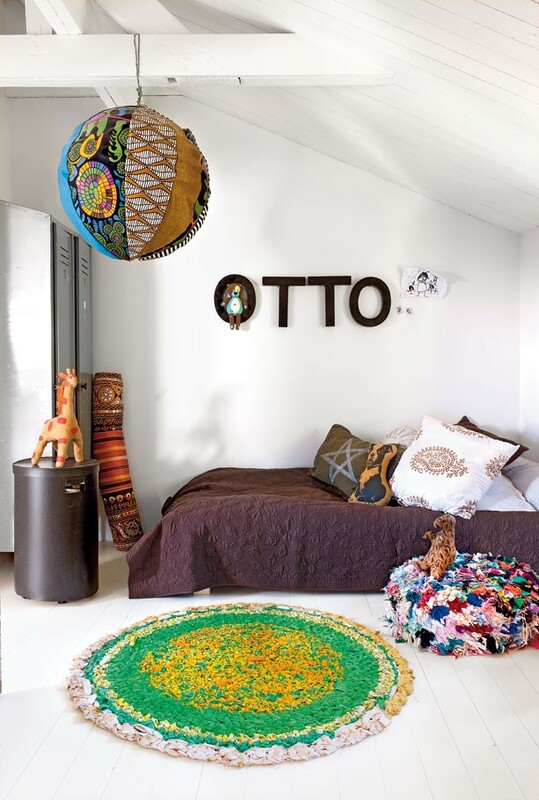 can i live there even if my name isn't Otto?! :) beautiful! That huge painting with all the fresh colours really blew me away. Absolutely fantastic! The painting in the 6th photo is too lovely. I just want to reach into the picture and steal it! A summer house in Sweden... sounds good to me! Yes Please, INDEED! Love it all! are we calling this nouveau boho? may I have that table in the photo with the leather topped bench?! purdy please?!!! I covet that table. hope you have a lovely weekend Marie!! I want to be Marie Olsson Nylander too! that second picture is so pretty and serene and I love all the pops of color throughout the pics. I am a fan!!! The white walls are wonderful and refreshing!! Thanks for sharing. Oh, my! ME, me me! I want to live here. I am saving all of these photos.